Today, January 28th, we celebrate one of the most illustrious and influential Saints of the Catholic Church, St. Thomas Aquinas. 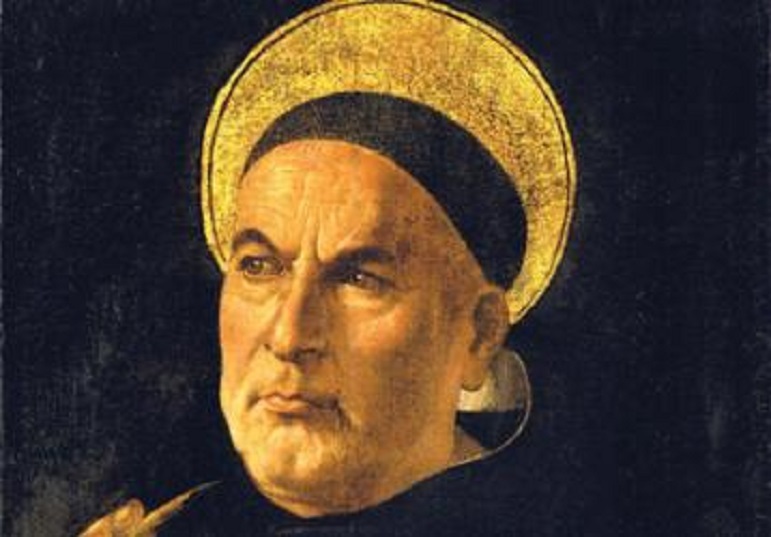 Thomas Aquinas is by far, the spokesman of the Catholic tradition of reason and divine revelation, being one of the greatest teachers of the Catholic Church, which is why he is named a Doctor of the Church and the Angelic Doctor. Thomas was born in or about 1225, the youngest of four sons, in the castle of Rocca Secca, to Landulf, a knight, and to Theodora, his mother of Norman descent. At the age of five, his parents took him to the Benedictine Monastery at Monte Cassino, hoping that he would join this Order and rise to the position of abbot. In 1239, he went to the University of Naples in Italy, to study the arts and sciences, and it was through this experience that he became interested in Aristotle. In or about 1243, Thomas joined the Dominicans, which was against his family’s desires. In fact, his mother ordered that his brothers capture Thomas. Accordingly, they did so and he actually remained at his home, wherein his family hoped to change his mind. You might say that he was put under “house arrest” because of his defiance. While he was imprisoned, he studied the Sentences of Peter Lombard and learned by heart a great portion of the Bible. After two years, his family gave up and allowed Thomas to go back to his Order of the Dominicans. Thomas then went to Cologne, finishing his studies under St. Albert the Great. Thomas, being reserved and a humble man, was not very well liked by his colleagues. He was a large man, receiving the nickname of “the dumb Sicilian ox.” However, St. Albert, his professor, said this of Thomas, “We call Brother Thomas the ‘dumb ox’; but I tell you that he will yet make his lowing heard to the uttermost parts of the earth.” Thomas’ brilliance was exceeded by his piety, and after he had been ordained a priest, he became so very close and united with God. In or about 1252, St. Albert and Cardinal Hugh of Saint-Cher insisted that Thomas go to the University of Paris to teach. Four years thereafter, he became a master and received his doctors chair. His duties included lecturing and preaching. In or about 1259 to 1268, he was made Preacher General in Italy and taught in the school of selected scholars attached to the papal court, teaching also in other towns and cities in Italy. In 1269, he went back to Paris, wherein St. Louis IX consulted him regularly with regard to important matters of state, as the king so respected Thomas. But the university referred an issue to him, a question upon which they were divided, whether in the Blessed Sacrament of the altar the accidents remained really or only in appearance. St. Thomas prayed fervently and with great love asked for direction from God. He wrote a treatise and laid it upon the altar before he submitted his answer publicly. Our Lord then appeared to St. Thomas saying to him, “Thou has written well of the Sacrament of My Body,” asking Thomas what He could give him as a reward. Thomas said, “I want only You, Lord, only You.” Oftentimes during Mass, especially during the Consecration of the bread and wine into the Body and Blood of Jesus, Thomas would cry, sobbing, being so touched of his role as a priest, and of the precious love of Jesus, knowing that he was in the Real Presence of the Second Person of the Blessed Trinity. St. Thomas was canonized in 1323, wherein his body lies in the cathedral of Saint-Sernin. St. Pius V conferred upon him the title of Doctor of the Church, and in 1880, Leo XIII declared him the patron saint of universities, colleges and schools. Thomas’ theological and philosophical writings fill twenty thick volumes and he was the first to comment on Aristotle, whose teaching he utilized in order to build up a complete system of Christian philosophy. Indeed, his most important work was the Summa theologiae, the most thorough and full exposition of theological teaching ever given to the world. This work was one of the three reference works used at the Council of Trent, the other two being the Bible and Pontifical Decrees. His achievements were not just attributed to his incredible writings. When Pope Urban IV, influenced by the visions of Blessed Juliana of Liege, decided to institute the Feast of Corpus Christi, he deferred to St. Thomas to compose the liturgical office and the Mass for the day, wherein Thomas showed his remarkable expression, known for doctrinal accuracy as for their tenderness of thought. Famous hymns, Pange lingua, O salutaris and Tantum ergo, written by Thomas, are regularly sung at Benediction. In spite of his greatness, he thought the best of others, thinking they were better than him, being extremely modest whilst he stated his opinion. He did not lose his temper in an argument and was extremely poised. St. Thomas Aquinas has always been one of my favorite saints. Whilst I was in high school studying philosophy, I would take books home containing his writings. I was drawn to these books, so I did not go out with my friends because I would rather stay home with St. Thomas and read what he said in my cozy bedroom. In fact, though they were kidding, my friends called me a “wallflower” because of my devotion to St. Thomas. I would laugh and tell them that they did not know what they were missing, and that at some point, they might understand. . . It is my childlike vision in my mind’s eye that sees a great celebration in Heaven today for our dear and great St. Thomas Aquinas! We love and respect you! We hope to some day be with you in Our Lord’s heaven, and maybe you can teach us there too! God be praised for this great and holy man!